Lipsy’s Manchester concession has been given a glamorous sophisticated makeover by UK creative agency Dalziel & Pow. The space – located in Next at the Arndale Centre – evokes a classic art deco hotel lobby with its bold geometry and gilded finishes, white marble and pale pink velvets in an evolution of Lipsy’s ‘Luxe’ retail concept. Playful and quirky nods to the theme include bellboy rails, a gold reception sign that spells out ‘concierge’ and a bell on the cash desk. Large-scale graphics and props such as books bring a domestic, lifestyle-led feel to the space. An internal window column feature has been designed to capture shopper’s attention creating a dramatic eye-catching entrance to a luxury boutique hotel lobby with mannequins on multi-height plinths representing the chic and fabulous clientele. This is joined by high-impact VM inside the store: an in-the-round central feature of gold powder coated discs and rails, on which key seasonal clothing and accessories pieces are showcased. Lipsy’s shoes and accessories offers are represented in-store for the first time. 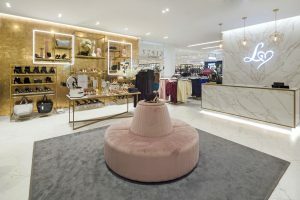 A gold metallic feature wall and padded pale pink seating create a luxurious, plush backdrop for this department, and key products are displayed on bespoke illuminated stands of white marble porcelain. The addition of innovative digital elements heightens engagement with Lispy’s tech-savvy female customers – digital wardrobes fitted with iPad-sized screens play a seasonal lookbook and rolling content relating to nearby product. There is also a large screen on the storefront to attract passing shoppers. This Lipsy concession is part of D&P’s major redesign of the entire Next flagship, which has seen three-floor store transformed into a social, experience-rich lifestyle destination. It is joined by an array of other complementary concessions, from a Gino D’Acampo My Prosecco and Pizza Bar to a Paperchase stationer’s and Ford car showroom.